French chefs are going to war! The chosen few of French chefs are demanding more marketing to promote French cuisine around the world and defend their mutual values and convictions. 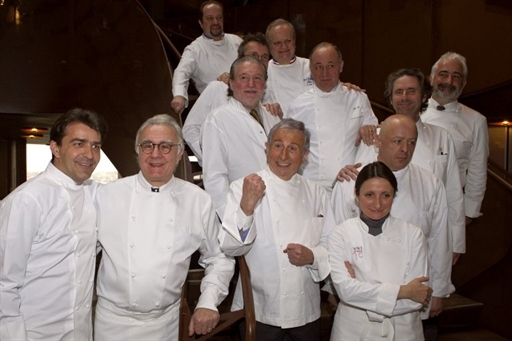 I’m too bad at mathematics to calculate the number of Michelin stars belonging to the 15 French chefs gathered today in the Eiffel Tower’s restaurant 58 : Alain Ducasse? Nine for him. Joël Robuchon? The most of any chef in the world: 26! 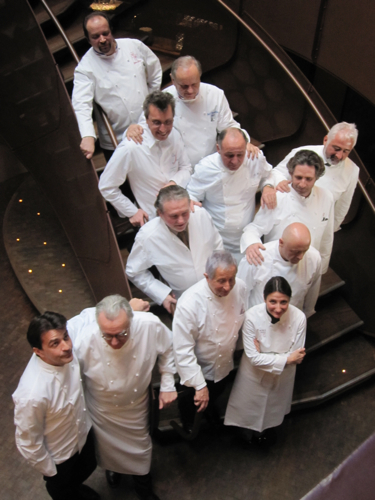 Add Yannick Alléno, Guy Savoy, Thierry Marx and, of course, Anne-Sophie Pic and all the others. Forget then about the numbers, just get on your knees. Think “molecular cooking”. Think Spain, Britain. Or name Ferran Adria and Heston Blumenthal. It’s the big cooking show and the business behind it that they don’t seem to appreciate. But why do they need a Collège? Doesn’t that sound a bit old fashioned? Well, it’s to promote, to do marketing, to make noise. You might wonder if this is really necessary. But it is. France is the undenied cradle of gastronomic cuisine. There is no other place in the world where the simple preparation of food reaches the same degree of sophistication, brilliance, come on, let’s say it: art. But its image has recently suffered serious damage. French cuisine has started to look a bit frumpy. It doesn’t look as innovative as what is being done elsewhere. Take the Bocuse d’Or, the biannual cooking contest in Lyon that draws the elite of the culinary world to Lyon. Who won it just a few days ago? Rasmus Kofoed from Denmark. Second was Tommy Myllymaki from Sweden and the third place went to Gunnar Hvarnes from Norway. Sounds like a Nordic declaration of war. Are they better, more inventive than the French chefs? Probably. But maybe there is marketing behind them too. Politicians. Support. Pride. Here in France everything seems to be taken for granted. That’s why the 15 chefs gathered around Ducasse are demanding, like he says “recognition of the economic impact” of French cuisine. Just recognition? No, Ducasse says: “cela passe par l’argent”. We are talking about money, about the fact that French politicians are not aware of the “industry” (Ducasse again) that is behind French cuisine. And it is an industry. With 480 000 employees gastronomy is the 4th biggest employer in the private sector in France. In 2009 no other sector generated more jobs. “French cuisine is an important factor for tourism in what is the world’s number one tourist destination”, says Michel Guérard. Since November the French gastronomic meal has belonged to the intangible world heritage. Was this good for its image or does it make French cuisine look even more frumpy? Well, the idea of a college also tastes slightly of dust. After all, this is only the name. The chefs are dreaming. They are ready to fight for recognition. They want an official lobby. This is legitimate. And this is their last wake-up call for the government.